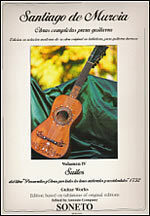 These SUITES belong to the same book "Passacalles" that S. de Murcia published in Madrid in 1732, titled "Passacalles and guitar plays through all the natural and accidental tunes". Following the Passacalles through to the end of the book a large number of tones in the French style of “Suites”. Among the there is a great version for guitar, the son ate VIII by Arcangelo Corelli, as well as a "Giga" by the same author, as a final ending to the suite V in Do Mayor. These plays or "Suites" by S. de Murcia belong to an important period of our Baroque guitar, that without any doubt, it's going to serve to make programs for the actual guitar players.